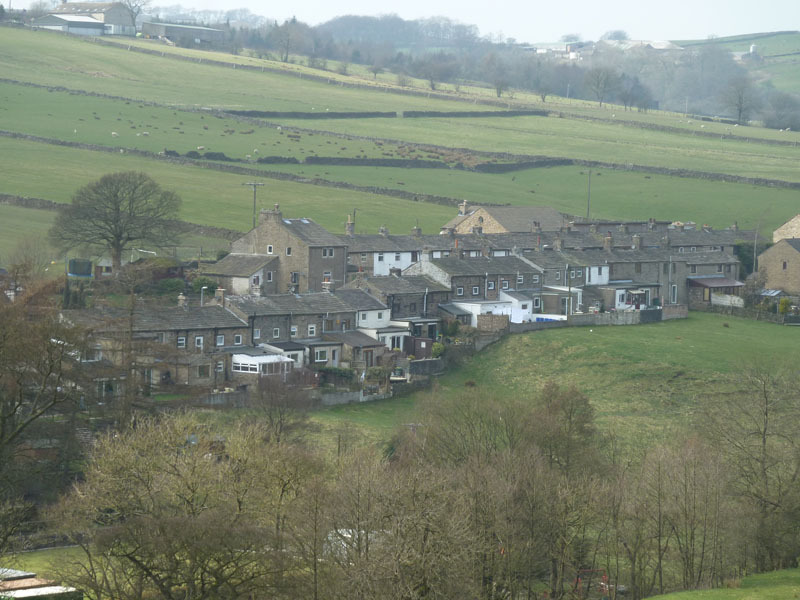 A few weeks ago I was up in Trawden without a thought in my head about the Brontës – well, not until someone in the pastoral meeting I was attending mentioned that we were a mere eight miles from Haworth. We may have been in a different county, but almost within hailing distance none the less. As I stared out of the big bay window on that bleak Saturday, watching the snow flakes swirling down against the backdrop of the steeply undulating moorland, it became obvious that I was in what most of us have convinced ourselves is authentic Brontëland. It began to seem very appropriate that, as we had driven the snaking icy roads to get there earlier that day, my friend and I had exchanged stories of the people we had worked with professionally, people wounded by traumas, some of them from childhood, some of them more recent. The Brontë family history is a painful one. They were well acquainted with grief. 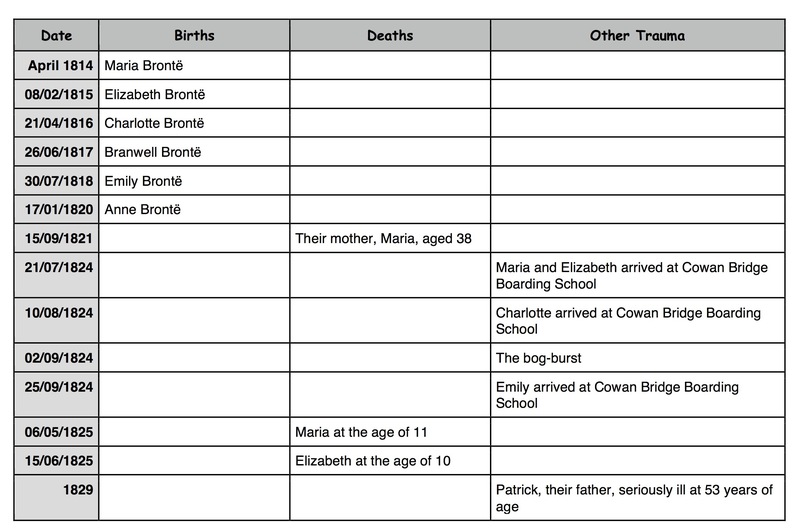 Even when I seemed to be distancing myself from it by putting it in a table to help me understand better how old the younger sisters were when the sequence of deaths that bedevilled their childhoods began, the pain of it was if anything even more visible. The trauma was not only about death. It was about the separation of the two older sisters from the youngest children, following so close after the mother’s death. It was about the atrocious conditions in the boarding school which ultimately contributed to the deaths of Maria and Elizabeth (see two earlier posts for the traumatic nature of boarding school education, even in the 20th Century). The table I’m including here stops at 1829: that was not the end of all the pain, but that’s something that will have to wait until a later post. I’ve referred recently to later triggers that reinforced the hint life gave me in Trawden. One of them was hearing about Samantha Ellis’s book. I’m only half-way through and already I have picked up a number of useful clues about the possible relationship between trauma and creativity. The mutilated editions are still everywhere. My own copy of the novel is a mutilated edition. It takes a while to find one that isn’t. 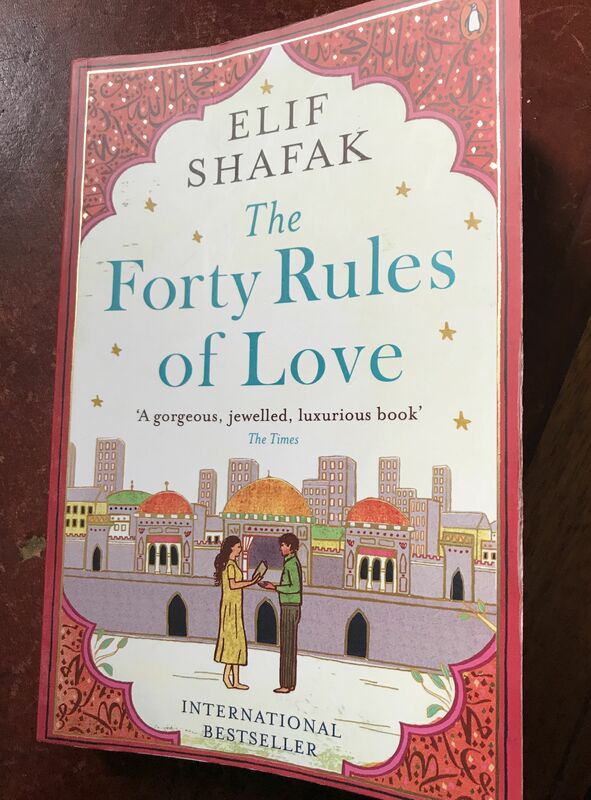 I get slightly obsessive about checking, and find butchered texts in bookshops, in libraries and on friends’ bookshelves, all bought in good faith, because unless you knew they weren’t right, you couldn’t tell. Her use of the word ‘mutilated’ intrigued me. It is as though this were for her a sort of posthumous traumatic atrocity. Some degree of outrage is, though, understandable, as I discovered soon after reading her words. To my alarm, I checked out my own copy of the Folio Society Edition. Surely you can trust the Folio Society to get it right? Apparently not. It is a mutilated version. This explained my own difficulty when I recently picked it up to read the novel for the first time. That’s right. I said ‘for the first time.’ I admit it. I was an Anne ignorer as well. Anyway, back to the main point. I was puzzled by the abrupt beginning, the result of Hodgson deleting the real opening from his version. I didn’t even realise at first that it was meant to be a letter, let alone who Gilbert was or why he was writing it. It didn’t take me long to work out via the web that my local bookshop had a copy. I rang them to make sure it was still there: it was and it was the only one they had. I put on my shoes, grabbed my coat and set off on the twenty minute walk to the shop as fast as I could in case someone else might get there first. Even as I walked I asked myself why was I so fired up about this. 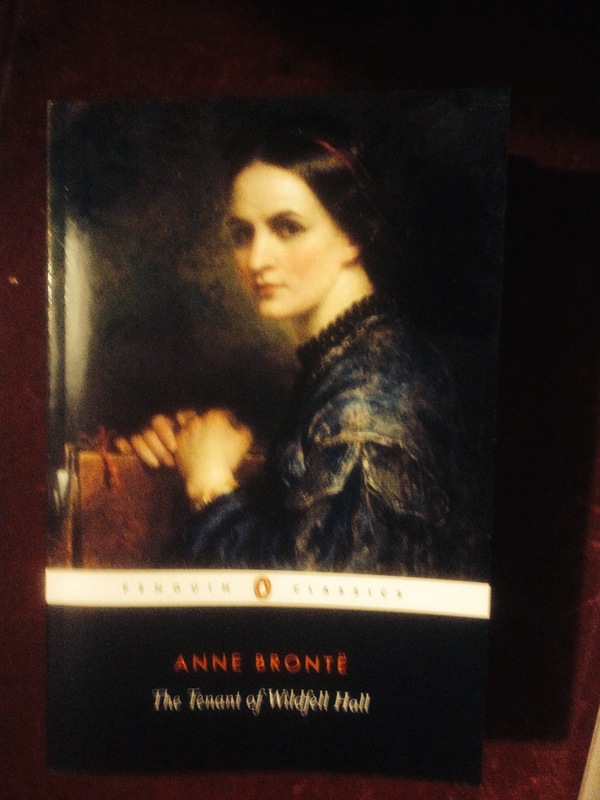 Anne has been dead just over a hundred-and fifty years. She’s not going to be upset, surely, if I buy it later, or even if I just read the butchered Folio copy I’ve got on my shelf. Then I remembered how Patrick Brontë had regularly walked ten miles to meet Anne’s mother before they married and ten miles back to his home. 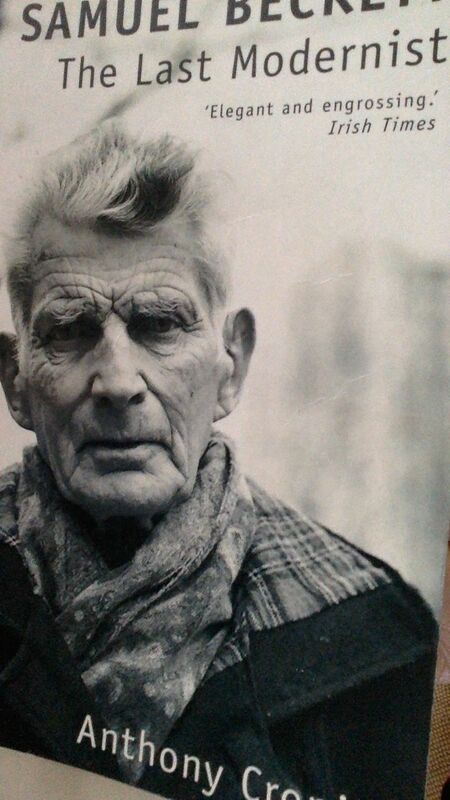 I remembered the integrity with which he had fought for justice later in his life, making far greater efforts than a twenty minute walk to do so. The injustice of a mutilated novel may seem small beer, but I realised it mattered to me. To appropriately honour Anne’s memory it was only right that I should rectify this travesty done in the name of easy money. As I walked home at a slower pace, taking the long route over the modest upward slope of Churchill Gardens, I was glad that I had made the effort. I had checked that the book did indeed contain the missing opening: then I was sure it also had all the other missing details, some of which are crucial to Anne’s depiction of her heroine, Helen. Some kind of justice had been done. I can now read what she really wrote when she created a book that would give women even then the strength to fight against oppression in the home. As I opened the door to go in, my wife asked where I’d been. She was surprised at my explanation. I couldn’t find a way to explain it then. I’m not sure whether I fully understand it now. Maybe this is all a sentimental rationalisation of an unfathomable impulse. The one thing I’m sure of is that I’ll be coming back to the Brontës on this blog sometime soon. I am slowly picking myself up after a busy festive season. At the end of it I found myself wondering what themes were calling me, as I’d rather dropped the ball over the last few weeks. I find I am being drawn to the Brontës by a number of hints including Sally Wainwright’s recent excellent documentary drama, To Walk Invisible (it’s available for another 19 days), and this excellent Guardian article of last Friday by Samantha Ellis, which redresses the balance in terms of Anne. The Brontës’s combination of trauma and creativity suggests that trauma can elevate a person to a higher level of understanding which is a form of transcendence, even in the absence of transliminality, unlike my rather glib conclusion in an earlier post’s diagram. So, I’ve added another substantial clutch of books to my list. Heaven knows when I will be able to read them all, let alone pull what I have learned into a coherent perspective. I guess I’ll not be keeping up my previous pace of posts for a few days or even weeks yet. I hope your patience with me will prove worth it in the end. Anyhow, here is a short extract from the Ellis post – how intriguing to have as a surname Emily’s pseudonym! Click the link for the full post. Seen as less passionate than Emily, less accomplished than Charlotte, Anne is often overlooked. But her governess Agnes Grey is a clear model for Jane Eyre. Anne Brontë started writing her first novel some time between 1840 and 1845 while she was working as a governess for the Robinson family, at Thorp Green near York. I imagine she must have made her excuses in the evenings, and escaped the drawing room, where she had to do the boring bits of her pupils’ sewing, and often felt awkward and humiliated – excluded from the conversation because she was not considered a lady, yet not allowed to sit with the servants either, because governesses had to be something of a lady, or how could they teach their pupils to be ladies? Anne must have stolen away to her room and pulled out her small, portable writing desk. Leaning on the desk’s writing slope (which was decadently lined in pink velvet), Anne could go on with her novel. She had to write in secret because she was skewering her haughty employers and her peremptory pupils on the page. Although her job was difficult and thankless, she had realised that it was providing her with excellent material, that she was telling a story no one else was telling. As she laboured away in her neat, elegant handwriting, Anne must have felt that she was writing a novel that would go off like a bomb. Agnes Grey sticks close to the facts of Anne’s life. The eponymous heroine is a clergyman’s daughter, just as Anne’s father, Patrick Brontë, was the perpetual curate of Haworth in Yorkshire. Anne doesn’t specify where Agnes grows up, but she does say she was “born and nurtured among … rugged hills”, so when I read the novel, I imagine the Yorkshire moors. Both Anne and Agnes were originally one of six children. Anne lost her two eldest sisters when she was five. Agnes has lost even more siblings; she and her older sister Mary are the only two who have “survived the perils of infancy”. Both Agnes and Anne are the youngest. When Agnes says she is frustrated because she is “always regarded as the child, and the pet of the family”, considered “too helpless and dependent – too unfit for buffeting with the cares and turmoils of life”, it feels like Anne talking. She always chafed at being patronised. . . . . Agnes turns to one of the only other jobs open to middle-class women: she decides to become a governess. . . . instead of an adventure, Agnes gets a crash course in how cruel the world can be, and how it got that way. One of Agnes’s pupils, Tom Bloomfield, enjoys torturing birds. One day his vile uncle, who encourages Tom’s cruelty, gives him a nest of baby birds. When Agnes sees him “laying the nest on the ground, and standing over it with his legs wide apart, his hands thrust into his breeches-pockets, his body bent forward, and his face twisted into all manner of contortions in the ecstasy of his delight” and he won’t be reasoned with, something rises within her. She grabs a large flat stone and crushes the birds flat. This brutal mercy killing is almost too violent to read. Agnes Grey’s first critics thought it went too far, but Anne insisted that “Agnes Grey was accused of extravagant overcolouring in those very parts that were carefully copied from life, with a most scrupulous avoidance of all exaggeration”. • A new Vintage Classics edition of Agnes Grey is published on 12 January. 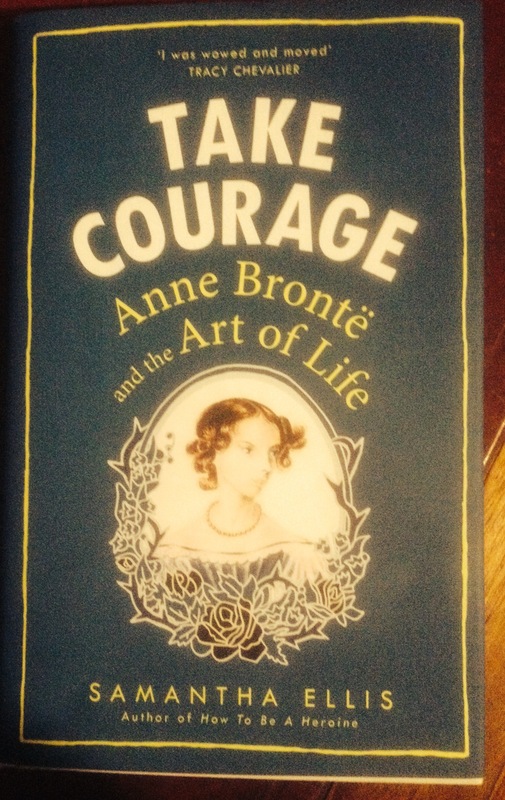 Take Courage: Anne Brontë and the Art of Life by Samantha Ellis is published by Chatto & Windus on the same date.